No one likes paying taxes. But when Georgians file theirs, they have the option to turn some of the pain into gain by giving to the Wildlife Conservation Fund checkoff. They can fill in any amount $1 or more on line 30 of Form 500 (the long form) or line 10 of form 500-EZ. Those contributions will then go to the Georgia’s Nongame Wildlife Conservation Fund. This fund is dedicated by law to conserving native species, from American oystercatchers to tri-colored bats and monkeyface orchid. 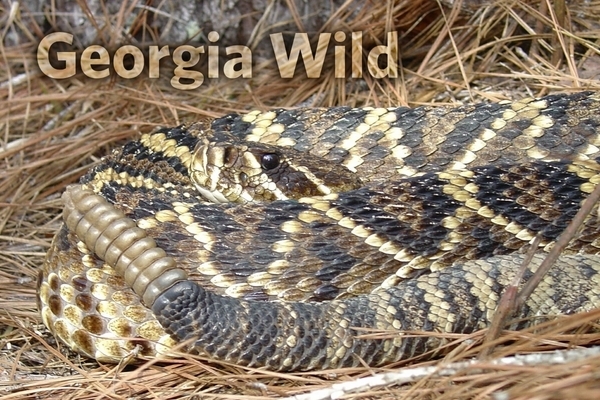 DNR’s Nongame Conservation Section, which restores and preserves these species and their habitats, depends mainly on grants, contributions and fundraisers ... fundraisers like the Georgia Wildlife Conservation Fund checkoff. Learn more. We’ve been here before. Or so goes the hope of scientists who monitor North Atlantic right whales. 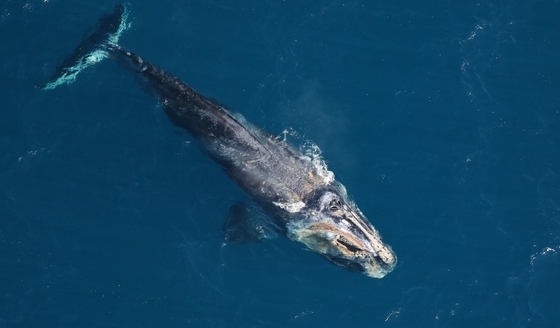 In winter 2000, only one right whale calf was seen off the coast of Georgia and north Florida, the only known calving grounds for the species. 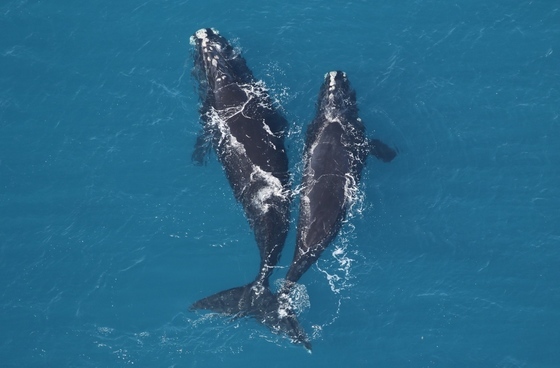 Yet the next year the right whale floodgates opened: Researchers reported 31 calves, the most since comprehensive aerial surveys began in the late 1980s. Senior wildlife biologist Clay George, who leads DNR’s right whale research, knows how quickly things can turn around. But that hasn’t made this winter any easier: Three months into the four-month right whale calving season, not a single calf has been spotted in Georgia or Florida waters. And there are other factors, dire ones, that suggest these school bus-sized mammals are not on the brink of a comeback but possibly sliding back toward extinction. George mentions the five calves seen last year, below-average calving totals since 2012 and fewer than 100 breeding females left in the entire North Atlantic right whale population, estimated at only about 450. With calving tanking, the number of dead right whales found along the Atlantic Seaboard in 2017 also surged to 17, nearly 4 percent of the population. “That’s not sustainable,” George said. More sobering insights: Right whales have traveled farther north into Canada to feed in recent summers, using habitats in the Gulf of St. Lawrence, where most of last year’s deaths occurred. Fewer whales have been seen in traditional feeding spots in the Gulf of Maine, along the U.S. and Canadian border. Scientists speculate the shift may be due to rising temperatures and changes in copepod populations, the tiny crustaceans the whales eat, filtering them from the water through baleen plates. Less food means leaner whales and fewer calves. The interval between when females give birth has stretched from an average of four years to 10. Add to the list a persistent killer – entanglement in commercial fishing rope – and the outlook is even dimmer. More than 80 percent of right whales bears scars from ropes used to catch lobsters, crabs and other seafood. Females that survive rope entanglements have lower reproductive output over their lifetimes. The downward trend is erasing earlier successes. The population grew by more than 200 whales from 1990-2010. With temperatures already warm enough to send whales back north, only 12 whales have been seen in the Southeast this winter. Two were females that had calved before. One was a male in poor condition. That is more than last winter’s record-low of seven whales. But it’s not enough to renew hope. Not yet. A parent feeds the remaining eaglet at the Berry College nest. 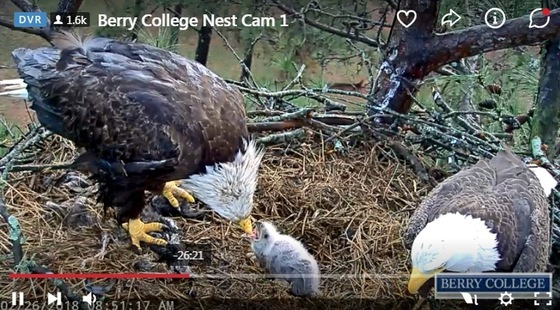 Viewers of the bald eagle nest live-streamed by Berry College expressed shock and grief when one of the nest’s two eaglets fell to its death last week. The eaglet, not quite 2 weeks old, was seen near the edge of the nest Thursday afternoon. Berry College’s Dr. Renee’ Carleton heard that night the bird may have fallen and found it dead under the nest tree, a tall pine near the northwest Georgia school’s athletic center. Berry posted the loss on Facebook late Thursday. By Monday, nearly 6,500 people had responded. One viewer, who said she is a teacher whose class follows the eagles, wrote that she was “sad beyond words and … (knows that) many here are just overwhelmed at this news.” “We will continue to watch the baby and work through what is a part of nature,” she added. Berry has one of the most popular nest cam sites. It has drawn about 2 million viewers this nesting season, and 5.8 million from September 2016-May 2017. Eagles have laid eggs in the nest for six straight years. The Southeastern Cooperative Wildlife Disease Study in Athens is examining the eaglet to see what might have caused it to move onto the nest rim and fall. Though protected by federal and state law, bald eagles are no longer listed under the Endangered Species Act. That status underscores the species’ resurgence across its range. DNR surveys counted a state-record 218 occupied nest territories last year. In the 1970s, there were no known nests in Georgia. Dr. Bob Sargent, who monitors eagle nesting for DNR’s Nongame Conservation Section, said the loss will not affect how the parents raise the surviving eaglet. Actually, its odds of surviving are improved because it will receive all of the food the adults bring, Sargent explained. Eaglet deaths in the wild are not unusual. While nearly all eagle nests in Georgia start with two eggs, the average number of eaglets fledged per nest is about 1.5, according to Sargent. A young bald eagle released almost two years ago in east Tennessee to commemorate Pearl Harbor was seen last month in north Georgia. Lake Nottely resident Debbie Davenport photographed “Survivor” (right) from her porch after seeing the eagle flying along the Blairsville lake Jan. 10, a misty day. The American Eagle Foundation, based at Dollywood in the Great Smoky Mountains, “hacked” the eagle in July 2016 as three veterans who survived the 1941 attack on Pearl Harbor watched. They named the eaglet. 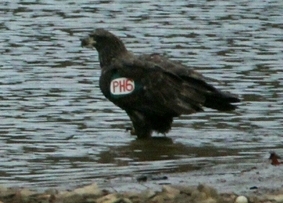 People who see PH6 are encouraged to contact the foundation. 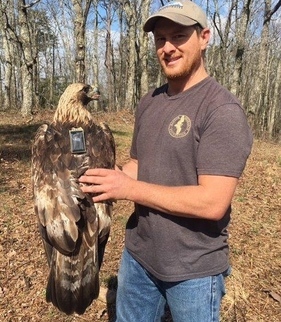 Another golden eagle from Georgia has been fitted with a transmitter to help researchers study the species’ migration routes and habitat use in the eastern U.S. The adult male was caught and released Thursday on the Chattahoochee National Forest’s Conasauga Ranger District. Dr. Tricia Miller of Conservation Science Global led the capture, done at a bait station set up by U.S. Forest Service wildlife biologist Ruth Stokes. Four golden eagles have been tracked from Georgia, including one from the same area (“Golden catch,” March 9) and two from west-central Georgia. However, the transmitter on the Chattahoochee National Forest bird caught last February stopped sending signals in Canada’s Northwest Territories in May. Nongame Conservation Section’s friends group, TERN, paid for the transmitters. Take a deep dive into the Nongame Conservation Section’s work with wildlife, plants and natural habitats in this new annual report. There's also a story map. The Georgia Outdoor Stewardship Act (House Bill 332), aimed at creating sustainable funding to protect and manage conservation lands, awaits a vote today in the House. Bills that don’t pass the House or Senate by the end of today are dead this session, unless attached to another bill. Recovering America’s Wildlife Act is making headlines. House Resolution 4647, bipartisan legislation to fund nongame conservation and help keep more than 12,000 species from becoming endangered, is in the news – from Dallas to Delaware – and more frequently following a subcommittee hearing in Congress this month. (Watch video of U.S. Rep. Jeff Fortenberry, R-Neb., and Bass Pro Shops' Bob Ziehmer, speaking on this and a bill to modernize the Pittman-Robertson Act). Designating 1.3 million acres in south Georgia as a Sentinel Landscape is a win for wildlife. The U.S. Agriculture, Defense and Interior departments will join with DNR and 20-plus federal, state and local organizations to conserve farms, forests and habitats and enhance military readiness. 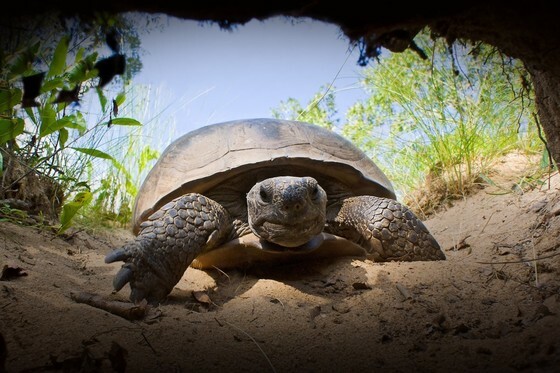 One partnership goal is to protect more than 20 viable gopher tortoise populations over the next five years. 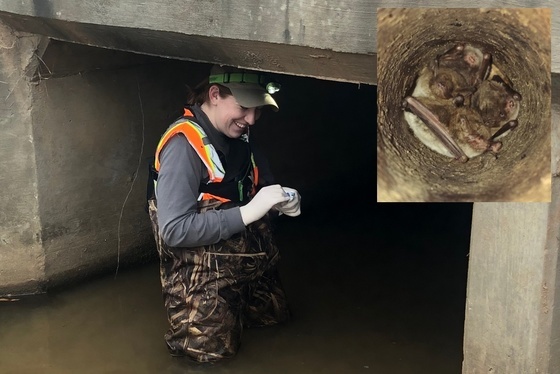 Considering that the Coastal Plain has few caves, Nongame Conservation is working with Kennesaw State University graduate student Kelly Lutsch to find bat roosts in road structures such as bridges and check the bats for white nose syndrome. One survey found 50 southeastern myotis in culverts near Cordele. Coming soon: some wild events you don’t want to miss. The 51st annual Claxton Rattlesnake & Wildlife Festival, March 10-11 and packed with live wildlife programs. Fitzgerald’s Wild Chicken Festival on March 16-17, going strong since transforming from a rattlesnake roundup in 2000. DNR’s Youth Birding Competition and T-shirt Art Contest, with the 24-hour-birdathon set for April 27-28. The April 13-15 kickoff to Charlie Elliott Wildlife Center’s Fish-n-Learn Program, a weekend of fishing how-to for children ages 8-15 and adults. Tallulah Gorge's peregrine falcons and ospreys nesting on camera at The Landings are back. Who’s not: Peregrines have not returned to nest on SunTrust Tower Plaza balconies, meaning no DNR falcons cam again this year. 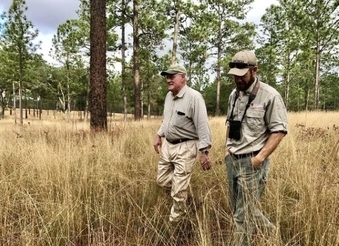 South Georgia landowner Charley Tarver explains his commitment to helping conserve endangered red-cockaded woodpeckers in this U.S. Fish and Wildlife Service profile. Also featured is DNR red-cockaded woodpecker biologist Joe Burnam. Nearly 40 eggs of endangered reticulated flatwoods salamanders were rescued from a dry pond at Mayhaw Wildlife Management Area near Colquitt because too little rain put the eggs at risk. They will be raised at Joseph W. Jones Ecological Research Center and metamorphs returned to the pond. The Amphibian Foundation has enjoyed stellar success raising endangered frosted flatwoods salamanders from eggs. 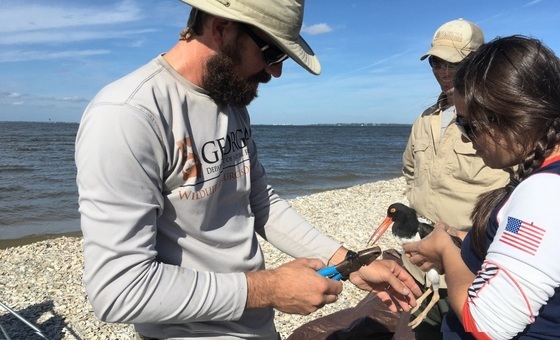 In concert with conservation agencies such as DNR, the Atlanta nonprofit hatched 88 viable eggs last year and recently all but two of 346 eggs from Apalachicola National Forest. DNR Forestry for Wildlife recognized CatchMark Timber Trust, Georgia Power and Weyerhaeuser as the program's 2017 partners. The corporate forestland owners were honored at the state Capitol with Gov. Deal Feb. 14 for work benefiting wildlife on about 1 million acres in the voluntary program. Ceremony photos. While Good Fire Week (Feb. 4-10) is over, DNR and other agencies continue to do good work with restorative prescribed fire across the state. 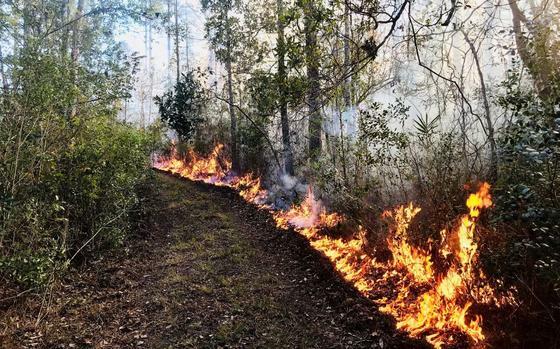 Prescribed fire is a safe way to apply a natural process, ensure ecosystem health and reduce wildfire risk. It’s not too late to enter the Give Wildlife a Chance Poster Contest. Held by DNR, the State Botanical Garden of Georgia and The Environmental Resources Network, friends group of the Nongame Conservation Section, the contest encourages K through 5th-graders to explore the outdoors through art. Know a teen who is keen on birding? DNR’s Camp TALON, set for June 2-7 this year, is a highly rated, coast-based camp for teens with a strong interest in the outdoors, birding and ecology. DNR's gopher tortoise survey crew came across some unique sights on Georgia Power property this winter. Included was this hatchling tortoise and an opossum in a tortoise burrow that was not pleased to see the crew's burrow camera. Georgia’s list of native turtle species will grow by one, going from 29 to 30, if research in the March issue of Molecular Phylogenetics and Evolution is adhered to – and stripe-necked musk turtle is changed from a subspecies to species. Names in the news: Nongame senior wildlife biologist John Jensen co-authored with four others a range-wide assessment of striped newts published in the October issue of Herpetological Conservation and Biology. The U.S. Forest Service named Mike Davis, forest fire management officer for the Chattahoochee-Oconee National Forests, its National Forest Fire Management Officer of the Year for the Southeast Region. Why the smiles? 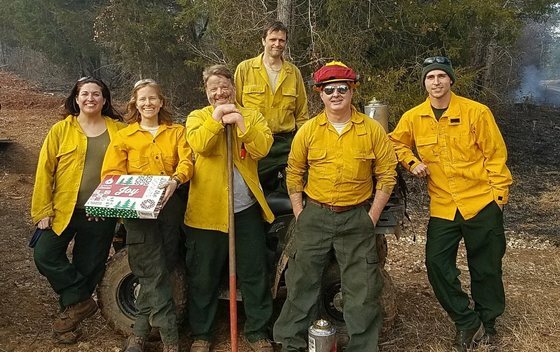 Because the prescribed fire this crew worked Jan. 26 on Lower Broad River Wildlife Management Area will help fan the flames of propagation at one of Georgia’s two naturally occurring populations of endangered dwarf sumac. The 180-acre burn included 40-acre “Rhus Knoll.” Only two male stems of dwarf sumac (Rhus michauxii) were visible at the knoll 10 years ago. Since, mechanical and fire management of trees and shrubs, plus adding female plants from the state’s other dwarf sumac stand to Lower Broad's male-only population (“Love story with leaves,” February 2010), have yielded 800-plus stems as well as fruit and fertile seed. The WMA near Elberton also is a safeguarding site for rescued Georgia aster. Masthead: See and learn about rattlers like this eastern diamondback photographed by Dirk J. Stevenson at the Claxton Rattlesnake & Wildlife Festival.